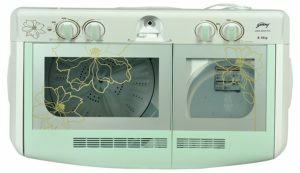 Looking to find out the Best Godrej Semi Automatic Washing Machines in India? I looked through the list of all semi-automatic washing machines that Godrej offers. The idea is to review the top few washing machines. 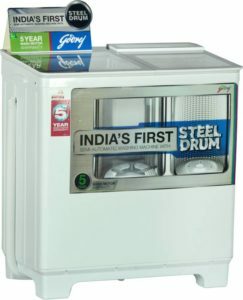 I have listed down the Top 5 machines Godrej semi-automatic washing machines in India. I will also be reviewing them in detail below. 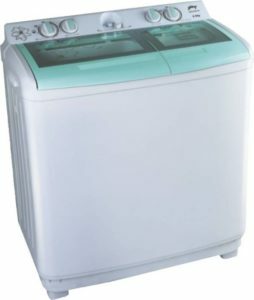 The common quality of all semi-automatic washing machine is that they will all be Top Load Machines. This is because all semiautomatic washing machines have two separate drums. One for washing the clothes and a separate one for the dryer. Godrej is a well know brand in the India household. Like the Tata’s they are also known for their quality of products and ethics in doing business. People prefer to buy Godrej products since they offer a great value for their money. If you just want a quick summary of the entire review, the next few lines are for you. 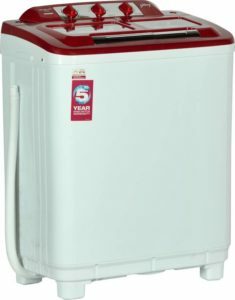 The Godrej 8 KG WS 800 PDS is the best washing machine that you can buy on this list. The washing has enough capacity for a family of 4. This is the only washing machine on the list which has a stainless steel wash drum, makes it more sturdy and long lasting. This is the first of 5 washing machines on this list. This product has the largest capacity amongst all the products on this list. The machine can handle a wash load of up to 8.5 kgs in one go. The washing machine is fitted with toughened glass lids. These lids are quite sturdy and flexible enough for daily use. The glass lids enable you to have a quick look at the clothes with opening them. 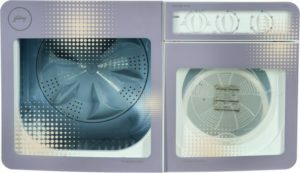 The washing machine is equipped with a Hexascrub pulsator. This is backed by a powerful 450 Watt motor to give your clothes a nice & clean wash. The washing machine also has an active soak functionality. You can use this for a heavy load which needs proper cleaning. The washing machine comes with a 2 Years comprehensive warranty & 5 years on motor. The leftmost knob is to set the washer timer. You can set time for a minimum of 5 minutes to a maximum of 35 minutes. The second knob gives you wash cycle selection. You can either select a normal wash or gently wash cycle. The third know simply gives you the option to drain the water after a wash cycle. Be sure to shift it back to wash mode before you fill more water. The last know is to select the spin cycle time duration. The machine also has wheels at the bottom for ease of movement. Both wash and dryer drums are made out of plastic. 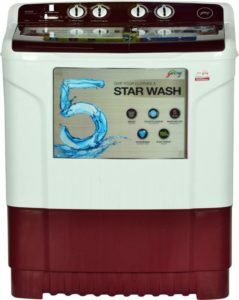 This is the best Godrej Semi Automatic Washing Machine that you can buy in India. The main reason for this is that it has a stainless steel drum. This really improves the life of your washing machine as well as the quality of the wash. This washing machine has a capacity of 8 Kgs and is good for a family of 4. The power consumption for the machine is 570 Watts. The machine has tempered glass lids. They are quite well made and sturdy. The lids also have a nice hydraulic system, which enables the lid to close slowly on it own. The product has a 2 years comprehensive warranty by Godrej and 5 years on the motor. Like the product above, this machine also has wheels at the bottom for ease of movement. The body of the washing machine is rust proof and hence makes this product very reliable overall. The machine looks and performs really well. It is also priced very attractively at the time of writing this review. As of now, the model is available in two different colours. This model has a wash capacity of 7 Kg. You can use for a family of 3 or 4. Sometimes, if you do have a lot of extra clothes (Over weekend etc), you might need to split your clothes into two different loads. The good news with smaller washing machines is that they also use less electricity. This particular machine has a wattage of 370 watts. The manufacturer also provides a two-year warranty for any production defects. This washing machine is ideal for someone with a family of three. It is also almost 1000 Rs. cheaper compared to the washing machine above. I will not go too much into the details of the machine as it has similar features to the one above. So apart from the load capacity, price and the looks, there is hardly much difference. This is the last washing machine in my review. 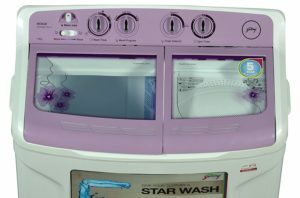 It is also the top-selling Godrej Semi Automatic Washing Machine in India. This product has a load capacity of 6.2 Kgs and is good for a small family of two members or for bachelors. The product performs really well and has lesser noise compared to similar products from other brands. 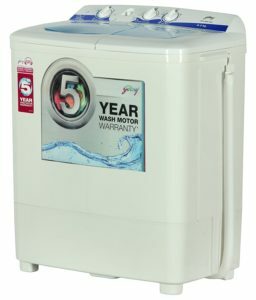 This product also comes with a 5-year warranty for the motor and overall warranty of 2 years on the product by Godrej. Since it has lower capacity and overall weight of the product is low too. It does vibrate a lot during the dryer cycles. What are the Advantages of Semi Automatic Washing Machines? They are cheap compared to fully automatic washing machines and hence more value for money. You do not need a constant supply of water. It is also not necessary for you to have the washing machine connected to a tap. You can pour water into the machine using buckets too. These machines are lighter compared to front load, fully automatic ones and hence more portable. Easier to use, as you can do most of the work standing upright. You need to keep an eye on the machine while the wash cycle is on. You need to manually intervene to change clothes from washer to dryer. I hope this review helped you select the right semi-automatic washing machine for your household. Do leave your thoughts in the comments section below.